There are multiple types of termites. Some common breeds are as follows: Dampwood, Drywood, Formosan, and Subterranean. Termites are detritivores (also known as detritus feeders) that feed on dead plants and trees. They also love to feast on dead parts of living trees as well as wood in the soil. Because a termite’s mouth is capable of tearing and shredding pieces of woody material, they can create a great amount concern when they are found in human dwellings. Even though termite workers are small and only measure approximately 1 cm to a few millimeters in length, their feeding habits can cause very large amounts of costly damage to property. And it’s not just property – foundations, furniture, shelves, and even books are all feeding sites for termites. Termites are often called the “silent destroyer” because they may be secretly hiding and thriving in your home or yard without any immediate damage signs. All termites consume cellulose-based plant materials. Unfortunately, all homes, regardless of their construction type, can provide cellulose food for termite infestation. Subterranean termites build their homes in soil, creating small mounds. Termites build elaborate mud tunnel systems within these mounds. These tunnels allow them hidden access to food sources above the ground. Drywood termites differ from subterranean termites in that they live in the wood they consume – essentially creating there home in the material they eat. Because of this they tend to infest walls and furniture. 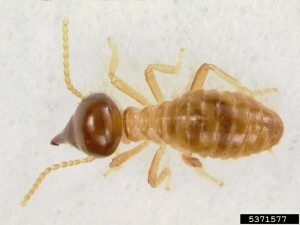 Winged and swarming termites appear when a colony has matured. Often these winged termites appear around windows and doors and because they are highly attracted to sources of light they tend to be the most active in springtime. Drywood termites locate to new locations after they mate in order to create a new colony. What this can mean is a spread in infestations and locations.